Addressing the Elephant in the Room: Is the Gigabyte MZ01-CE0 a Workstation Motherboard? Most of these are easily correctable via PCIe add-in card slots. At the same time, doing so means one is utilizing the very slots that make this motherboard so unique. There are two rear USB 3.0 ports, and internally the USB 3.0 header’s orientation can create some tight fits. Here is an example from the Ultra EPYC. The SATA situation is quite nice with the four Slim SAS connectors. We like this. 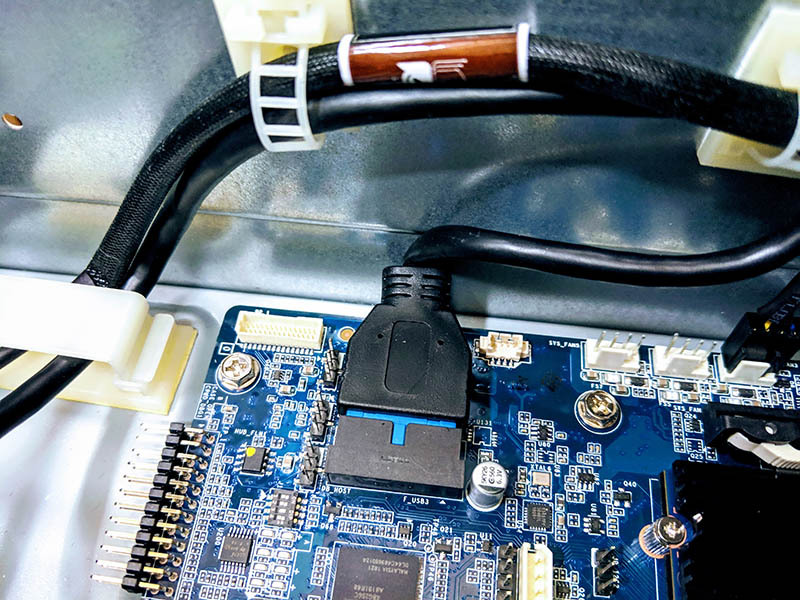 At the same time, that means one does not have any traditional 7-pin SATA connectors for SATA DOMs or other lower-cost storage options. Instead, one needs Slim SAS cabling. Fan control can be done via IPMI, but that is a different level of involvement than having a nice GUI. If you are using multiple GPUs, cooling noise will become considerable. Finally, as of this writing, one can utilize high-core count EPYC processors, like the AMD EPYC 7551P. With that said, the AMD EPYC 7371 is a better workstation fit due to higher clock speeds. They are not quite in the 4.5-5.0GHz range common on many consumer and higher-end workstation parts, but it is close to 4.0GHz at least making it bearable for inevitable single-threaded tasks. The processor selection is still not optimal. On the other hand, you choose AMD EPYC single socket for its PCIe connectivity which the Gigabyte MZ01-CE0 delivers upon. Even with these challenges, the Gigabyte MZ01-CE0 can be utilized as a workstation motherboard. 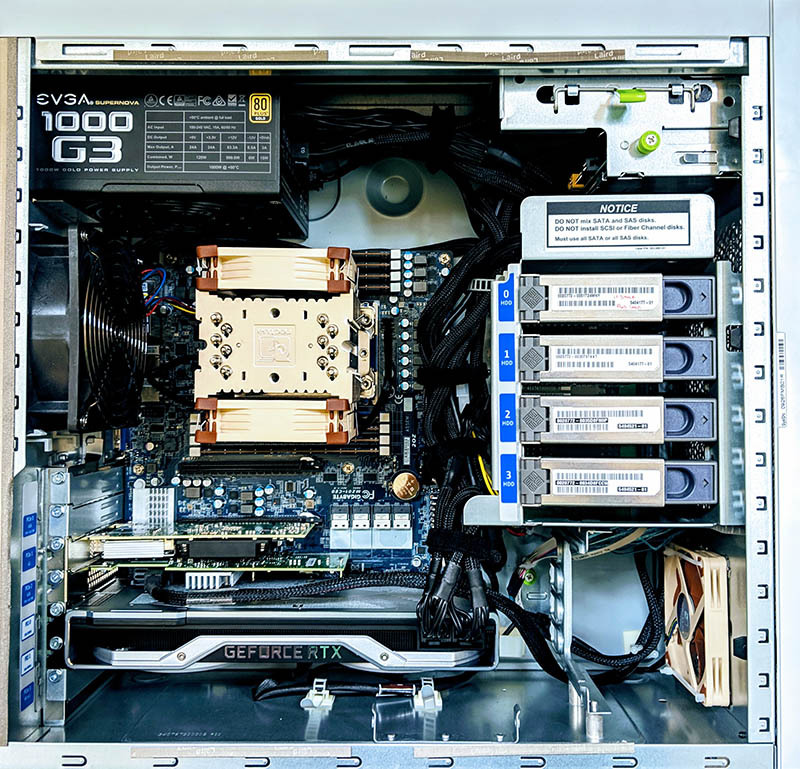 At the same time, we want our readers to go into that fully knowing that there are going to be a few challenges involved with using a server motherboard as a workstation part. To decree this a workstation motherboard without noting challenges would be disingenuous. If you are thinking of using the MZ01-CE0 for your own, or your customer’s workstations, you should be aware that you will need to augment peripheral connectivity. With the AMD EPYC 7001 “Naples” generation, system topology is more important in a single socket form factor than it has been for some time. We have started showing topology maps for our system and motherboard reviews. Here we had an M.2 NVMe installed on the motherboard along with a 40GbE NIC installed in a PCIe 3.0 x8 slot. 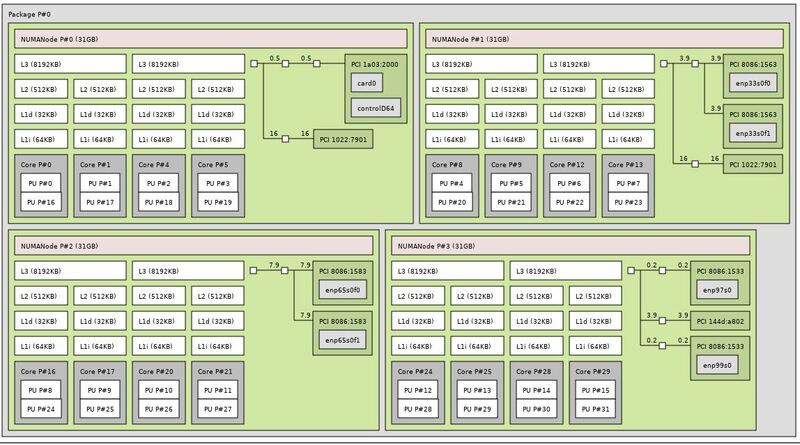 As you can see, with this configuration we have all four NUMA nodes with attached PCIe devices using the Gigabyte MZ01-CE0. As one can see, this is a robust block diagram for an ATX platform. We would have liked to have seen AMD tie PCIe lanes to Naples dice, however, with Rome coming we can see why they would not. Next, we are going to look at the management solution which is a significant departure from what Gigabyte used previously. I hope they make PCIe 4.0 version too! Only issues I see is 4th GPU blocking fan headers located at bottom and only 2* USB root. Could you cover FAN speed control options? Is there way to make user defined temperature vs. pwm% profile? Or other way to keep it bedroom-silent in idle and temperatures down at full load? Servethehome there is a real shortage of graphics workstation related benchmarking that is being done on Epyc 1p/2p systems could someone fill the void and do some more Blender 3d related CPU rendering benchmarks on both 1p 1nd 2p Epyc systems. I’m getting tired of there being only Threadripper related Graphics Workstation related content available and very little Epyc related Graphics workloads benchmarking being done. AMD’s Epyc 7371 is a much higher clocked part just released at the end of 2018 and I’d love to see a similarly clocked 1P 32 core Epyc/Naples part introduced by AMD. Epyc/Naples represents a much better Cost/Feature value than even AMD’s Threadripper platform when one considers the Epyc/Naples Platform’s 128 PCIe lanes and 8 memory channels per socket. But really More Folks are making use of Blender 3d than ever before and the cost of Blender 3d is a no brainer when paired with some Epyc hardware options that are even better cost/feature deals than any consumer branded processor variants/platforms. I’ve been looking for this mobo since, say, November. Can’t seem to find it available for purchase [and I tried most of the Gigabyte links too]. I did however find “Gigabyte MZ31-AR0 – 1.0” [cough a*azon, n@w@gg, c.d.w., etc]. Near as I can tell it’s very similar to the MZ01-CE0 … sfp+ ports and 16 dram slots vs. baseT and 8 slots. So perhaps a better option. This board is screaming as an AIO homelab style server board. 10Gb integrated, 1Gb ports for separate networking. Standard ATX form factor, aka drop into any case you want. The PCIe connectivity gives you the possibility of at-home VDI-style gpu passthrough. 16 Sata seems to be the sweet spot for me personally, and drives are getting larger and more abundant still for the connection type. Plus the onboard m.2 for cache ssd. management iKVM al-la Supermicro style FREE. Looking forward to the next board review! Maybe buy a 90° adapter for the 19-pin USB3 header, they cost like $5 on ebay for a 5-pack of them. I’d challenge that. Mini-ITX mobos have resorted to stacking two M.2 on top of each other, this would have been possible here too. Of course it won’t be as relevant if AMD jumps to 5. 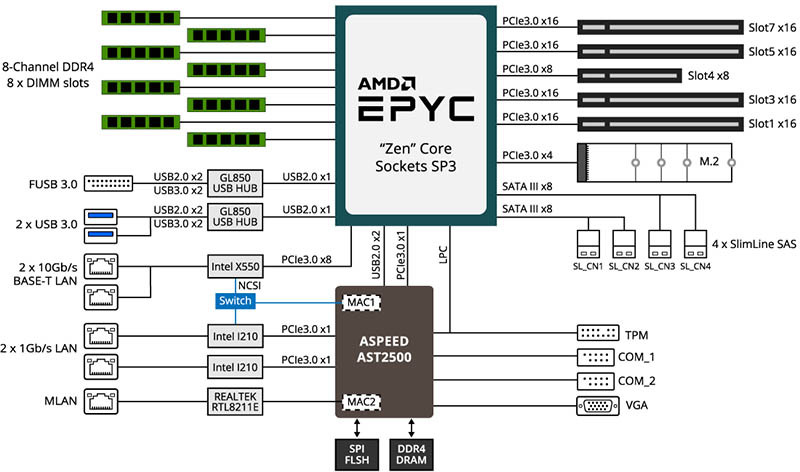 How do the PCIe Lanes work with Epyc? I never asked that, but are all 32/64 attached to one node or do the nodes each have 16/32? I think that’s kinda important when you want to do something with multiple graphics cards.